In the latest trailer for Orange is the New Black Season 5, the women of Litchfield are taking over the prison after the explosive conclusion to season 4. Season 4 of Orange Is the New Black saw the prison being privatized and brought a new set of racist guards that abused the women of Litchfield and their power. Tensions between the guards and inmates grew tighter and tighter throughout the season. At the end of the finale, the tension broke and everything spiraled out of control. A peaceful protest ended in tragedy when the guards attempted to remove the women of Litchfield by force and in the process killed Poussey. 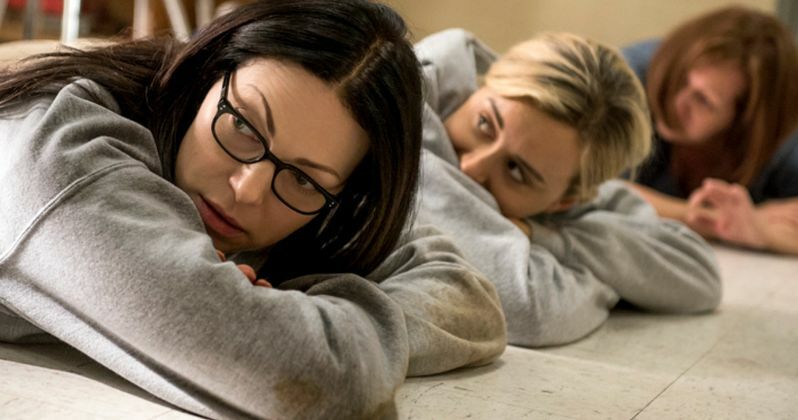 Orange is the New Black Season 5 trailer comes to us courtesy of the Netflix official YouTube channel and takes place right after the events of season 4 with a full-scale riot after the death of Poussey. The riot escalates when inmates unite to take over the entire federal prison. The women of Litchfield want justice for Poussey as well as the unfair abuse that they went through over the course of season 4. The trailer contains some powerful speech from Taystee. She says. "We're all angry! You've done our girl wrong, Mr. Caputo, and we want justice." As the trailer moves on, Taystee gets more enraged. She loudly shouts. "You see what's going on here? We get beat for no reason. We're stuffed four in a bunk like we're factory chickens. We're denied basic humanity." The new trailer for season 5 is intense and emotional as these women try to gain back the basic freedoms that they rightfully deserve. There are some bits of comedy thrown in for levity, but for the most part, this trailer does not let up. Adding to the drama is the soundtrack playing in the background, which is a brooding song by artist Bishop Briggs entitled "The Way I Do." Orange is the New Black Season 5 will take place over the span of three days and the inmate's lives will forever be changed as they unite to fight for the redemption, resolution, and respect that they deserve. As reports of Netflix hacks start to simmer down, the new trailer for Orange is the New Black Season 5 comes at the right time to setup the show the way that the powers that be intended. The show isn't meant to be watched through an illegal leak, it's supposed to start with this first trailer that lays the emotional foundation that season 5 will be built upon. Good for Netflix for holding strong and releasing the show on the original release date. It looks as if the fans that held out will be rewarded in kind to binge watch next month. Orange is the New Black Season 5 will premiere on June 9th, 2017 on Netflix. There has been no word lately on the previously reported "security feature" that could possibly lock down episodes 11-13 until the first 9 episodes have been watched. Netflix seems to be ignoring the whole scandal all together and that is definitely working in the network's favor. Watch the trailer for Orange is the New Black Season 5 below.